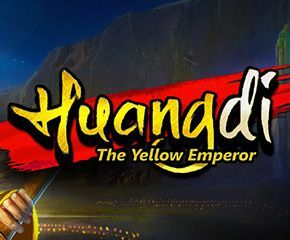 Huangdi is a famous Yellow Emperor in Chinese mythology who ruled about 5000 years ago. All that is known about him now is that he was the initiator of complete Chinese civilization. Huangdi The Yellow Emperor is themed upon this great ancestor of Chinese. Microgaming has released it with nice depictions and bonus features. 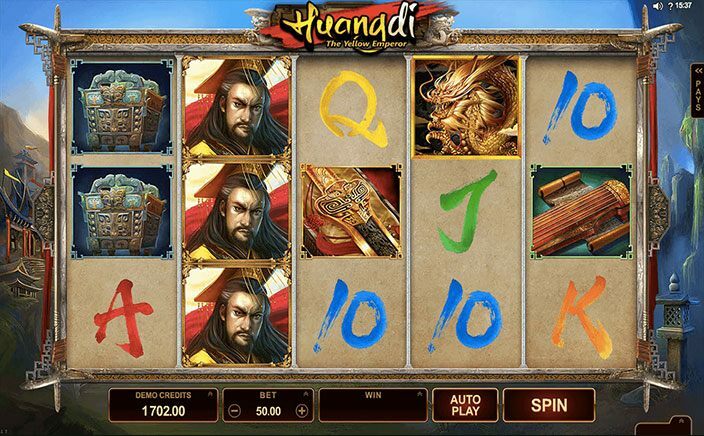 Huangdi The Yellow Emperor is basically a five-reel slot which has been released with 3 rows and 25 paylines. As soon as you will get into it, you will see a delicate ornate frame surrounding the reels and the background consists of various traditional Chinese buildings and mountains designed against a blue sky. The major symbols are represented by Huangdi and three ornately designed things which must belong to the emperor himself. Apart from this, the minor symbols are taken over by the card values 10, J, Q, K, and A.
Huangdi The Yellow Emperor’s logo represents the wild symbols. Just like any standard online slot, in this game as well, the wild symbol is going to replace other symbols to form some winning combinations. However, the golden dragon symbol can’t be replaced, and it is the scatter symbol which will help you in activating the main feature. • Expanding Symbols – Huangdi The Yellow Emperor comes with two different bonus features. Out of which, you can activate expanding symbols by landing a complete stack of major symbols on the first reel in the basic gameplay. Doing this will expand matching symbols on other reels as well, giving you high chances of landing big wins and wild symbols. • Free Spins – This is the main bonus feature of the game and will be triggered if you will land three or more golden dragon symbols on any of the reels, awarding you fifteen free spins. If you are lucky enough, then you might have wild symbol stacked on the first reel as well. The good news is that expanding symbols also occurs during this feature as well making wild symbols to expand for extra wins. You can also trigger more spins by landing more scatter symbols. Huangdi The Yellow Emperor has got some nice decorations on the reels and bonus features to give you some nice time. It offers an RTP of 95.48%. The free spins bonus feature has been launched with plenty of variations which can offer you some high wins. So, if you enter here on your lucky day, you will never wish to get out.